WASHINGTON -- The National Security Agency has been gathering records of online sexual activity and evidence of visits to pornographic websites as part of a proposed plan to harm the reputations of those whom the agency believes are radicalizing others through incendiary speeches, according to a top-secret NSA document. The document, provided by NSA whistleblower Edward Snowden, identifies six targets, all Muslims, as “exemplars” of how “personal vulnerabilities” can be learned through electronic surveillance, and then exploited to undermine a target's credibility, reputation and authority. The NSA document, dated Oct. 3, 2012, repeatedly refers to the power of charges of hypocrisy to undermine such a messenger. “A previous SIGINT" -- or signals intelligence, the interception of communications -- "assessment report on radicalization indicated that radicalizers appear to be particularly vulnerable in the area of authority when their private and public behaviors are not consistent,” the document argues. The Director of the National Security Agency -- described as "DIRNSA" -- is listed as the "originator" of the document. 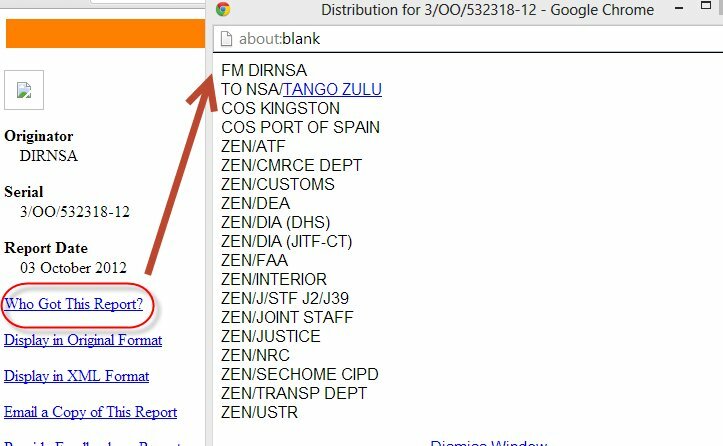 Beyond the NSA itself, the listed recipients include officials with the Departments of Justice and Commerce and the Drug Enforcement Administration. "Without discussing specific individuals, it should not be surprising that the US Government uses all of the lawful tools at our disposal to impede the efforts of valid terrorist targets who seek to harm the nation and radicalize others to violence," Shawn Turner, director of public affairs for National Intelligence, told The Huffington Post in an email Tuesday. Instead, the NSA believes the targeted individuals radicalize people through the expression of controversial ideas via YouTube, Facebook and other social media websites. Their audience, both English and Arabic speakers, "includes individuals who do not yet hold extremist views but who are susceptible to the extremist message,” the document states. The NSA says the speeches and writings of the six individuals resonate most in countries including the United Kingdom, Germany, Sweden, Kenya, Pakistan, India and Saudi Arabia. The NSA possesses embarrassing sexually explicit information about at least two of the targets by virtue of electronic surveillance of their online activity. The report states that some of the data was gleaned through FBI surveillance programs carried out under the Foreign Intelligence and Surveillance Act. The document adds, "Information herein is based largely on Sunni extremist communications." It further states that "the SIGINT information is from primary sources with direct access and is generally considered reliable." According to the document, the NSA believes that exploiting electronic surveillance to publicly reveal online sexual activities can make it harder for these “radicalizers” to maintain their credibility. "Focusing on access reveals potential vulnerabilities that could be even more effectively exploited when used in combination with vulnerabilities of character or credibility, or both, of the message in order to shape the perception of the messenger as well as that of his followers," the document argues. 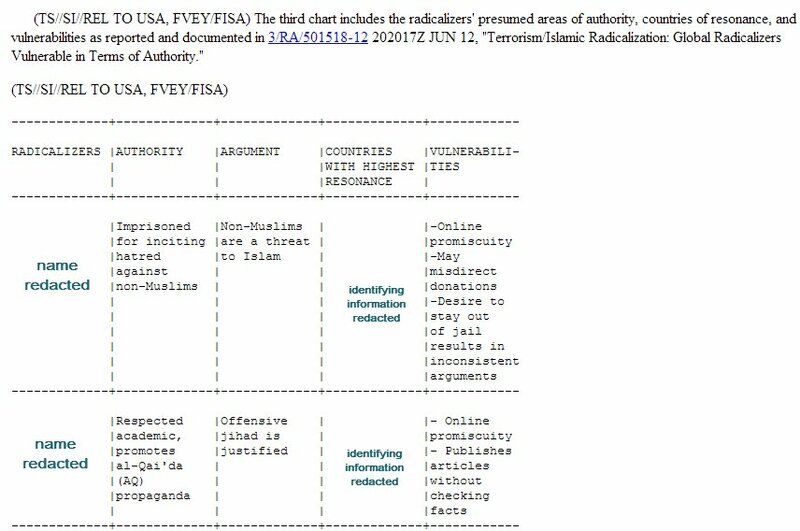 An attached appendix lists the "argument" each surveillance target has made that the NSA says constitutes radicalism, as well the personal "vulnerabilities" the agency believes would leave the targets "open to credibility challenges" if exposed. One target's offending argument is that "Non-Muslims are a threat to Islam," and a vulnerability listed against him is "online promiscuity." Another target, a foreign citizen the NSA describes as a "respected academic," holds the offending view that "offensive jihad is justified," and his vulnerabilities are listed as "online promiscuity" and "publishes articles without checking facts." A third targeted radical is described as a "well-known media celebrity" based in the Middle East who argues that "the U.S perpetrated the 9/11 attack." Under vulnerabilities, he is said to lead "a glamorous lifestyle." A fourth target, who argues that "the U.S. brought the 9/11 attacks on itself" is said to be vulnerable to accusations of “deceitful use of funds." The document expresses the hope that revealing damaging information about the individuals could undermine their perceived "devotion to the jihadist cause." 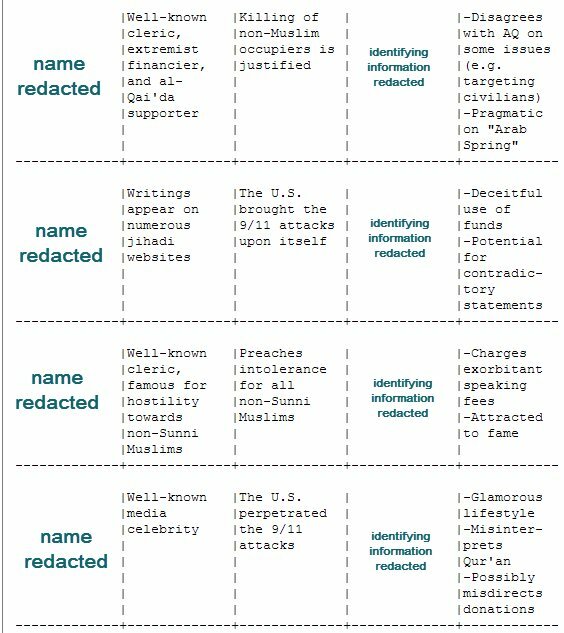 The Huffington Post is withholding the names and locations of the six targeted individuals; the allegations made by the NSA about their online activities in this document cannot be verified. The document does not indicate whether the NSA carried out its plan to discredit these six individuals, either by communicating with them privately about the acquired information or leaking it publicly. There is also no discussion in the document of any legal or ethical constraints on exploiting electronic surveillance in this manner. While Baker and others support using surveillance to tarnish the reputation of people the NSA considers "radicalizers," U.S. officials have in the past used similar tactics against civil rights leaders, labor movement activists and others. Current FBI Director James Comey recently ordered new FBI agents to visit the Martin Luther King, Jr. Memorial in Washington to understand "the dangers in becoming untethered to oversight and accountability." James Bamford, a journalist who has been covering the NSA since the early 1980s, said the use of surveillance to exploit embarrassing private behavior is precisely what led to past U.S. surveillance scandals. "The NSA's operation is eerily similar to the FBI's operations under J. Edgar Hoover in the 1960s where the bureau used wiretapping to discover vulnerabilities, such as sexual activity, to 'neutralize' their targets," he said. "Back then, the idea was developed by the longest serving FBI chief in U.S. history, today it was suggested by the longest serving NSA chief in U.S. history." That controversy, Bamford said, also involved the NSA. "And back then, the NSA was also used to do the eavesdropping on King and others through its Operation Minaret. A later review declared the NSA’s program 'disreputable if not outright illegal,'" he said. Baker said that until there is evidence the tactic is being abused, the NSA should be trusted to use its discretion. 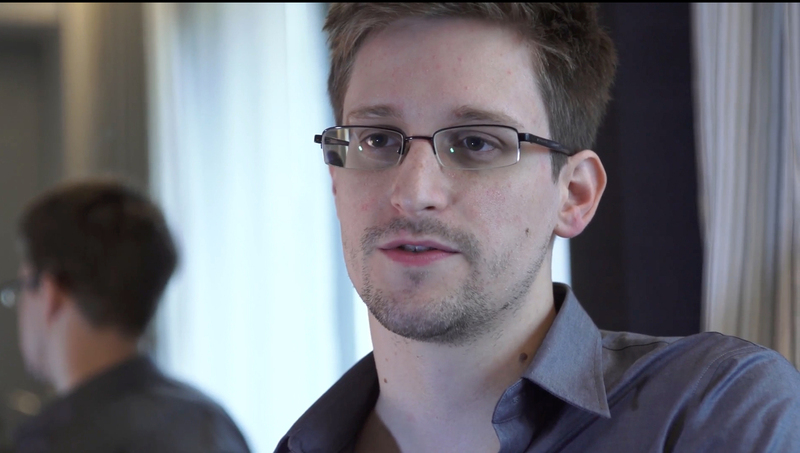 "The abuses that involved Martin Luther King occurred before Edward Snowden was born," he said. "I think we can describe them as historical rather than current scandals. Before I say, 'Yeah, we've gotta worry about that,' I'd like to see evidence of that happening, or is even contemplated today, and I don't see it." Jaffer, however, warned that the lessons of history ought to compel serious concern that a "president will ask the NSA to use the fruits of surveillance to discredit a political opponent, journalist or human rights activist." "The NSA has used its power that way in the past and it would be naïve to think it couldn't use its power that way in the future," he said.